Asthma is a chronic lung disease that causes episodes of difficulty in breathing. 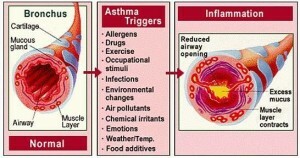 Asthma symptoms are caused primarily by chronic inflammation of the airways. This makes the airways of the patient with asthma highly sensitive to various triggers. Examples of triggers such as dust, animal furs, extreme weather change and exercise. When the airways is triggered by any type of external or internal factors, the airways swell and fill with mucus. Muscles within the airways will contract which can lead to further narrowing of the airways. The airways narrowing makes it difficult for the air to be breathed out from the lungs and it lead to various symptoms of asthma. The asthma can affect people of all ages including breast feeding mother. 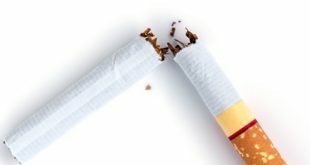 Why is it important to use inhaled steroid in asthma patient? As asthma is a chronic inflammatory condition of the airways, anti-inflammatory drugs such as steroid inhaler is one of the main treatment for asthma patients. 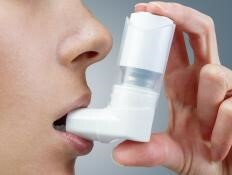 Reducing the inflammation of the airways will further decrease the bronchial hyper-responsiveness and asthmatic attack. 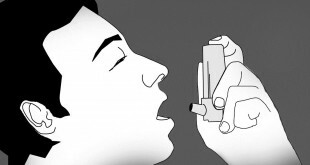 Inhaled steroid is the main preventive drugs in asthma. It should be taken via inhalation route and the dosage should be kept to a minimum to reduce side effects (side effects usually occur locally). Short term oral steroid may be used for treatment of acute attack of asthma (Acute Exacerbation of Bronchial Asthma). 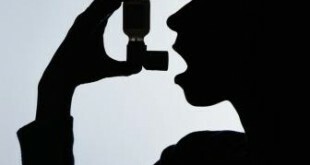 However, long-term oral steroids is rarely used for severe uncontrolled asthma. What are the impacts/ complication of uncontrolled asthma? With proper treatment, asthma patient can have very few symptoms, if any, and they can lead a normal, active live and sleep through the night without interruption from asthma. 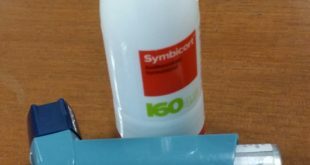 Is it safe to use steroid inhaler in breast feeding mother? Asthma control in the breast feeding mother is as important as for other non-pregnant women, and the risk of asthma exacerbation is similar in both groups. There are limited studies about the safety of asthma drugs during breastfeeding. Published studies in the postpartum period have been small case series with generally short follow-up. The infant’s exposure during breast feeding is 10 to 1000 times less than during in the mother’s womb. Therefore, it is recommended that breast feeding women should be encouraged to continue with the inhaled steroid if they have used it before pregnancy, especially if this regimen adequately controlled their asthma. Asthma is a chronic lung disease that can cause episodic symptoms which might interfere with daily activities or even can lead to life-threatening attack. The used of inhaled steroid is important to improve asthma control and prevention of both short-term and long-term complications caused by asthma. Breastfeeding should be continued in women with asthma even though they are on inhaled steroid. In general, asthma medications including inhaled steroid are safe during lactation and the benefits outweigh any potential risks to the baby. Lim A, Hussalny SY, Abramson MJ. Asthma drugs in pregnancy and lactation. Australian Prescriber 2013;36(5):150-153. Lokeln YC, editor. Pregnancy and breastfeeding medicines guide. Melbourne: Pharmacy Department, Royal Women’s Hospital; 2010. Ilett K, Kristensen J. Drug use and breastfeeding. Expert Opin Drug Saf 2005;4:745-68. Lawrence R, Schaefer C. General commentary on drug therapy and drug risk during lactation. In: Schaefer C, Peters P, Miller RK, editors. Drugs During Pregnancy and Lactation: Treatment Options and Risk Assessment. 2nd ed. London: Elsevier; 2007. p. 609-20. Fält A, Bengtsson T, Kennedy B-M, Gyllenberg A, Lindberg B, Thorsson L, et al. Exposure of infants to budesonide through breast milk of asthmatic mothers. J Allergy Clin Immunol 2007;120:798-802.